HomeAll Posts...What Exactly ARE GMOs?! Genetically modified crops are created through a process called transgenesis, which means taking a gene from one species and sticking it into another. Proteins that have been added to GMOs are already in nature. Genetically modified crops, generated through a process known as “transgenesis” (which will be described further below), were commercially introduced in the United States in 1994. Over the last few decades, farmers have used transgenic seeds with greater frequency due to the benefits they offer. Now, these seeds account for the majority of corn, soy, and cotton grown in the US. Advocates of transgenic crops state that these have reduced pesticide use, increased yields, and profits, and will play an increasingly important role this century as we deal with the impacts of global warming and the demands of a growing population. Additionally, they point to the scientific consensus and the existing body of data, which suggest that the existing crops on the market are safe. Critics of the technology claim that the technology is not necessary, that it poses a potential risk, and at the very least should be labeled. I hope to share with you some of the different aspects and nuances of these statements, and their validity. The working units within any cell are proteins. Proteins are made up by linking together amino acids in a given sequence. The exact amino acid sequence is defined in the cell’s DNA; the DNA blueprint for a specific protein is known as a gene for that protein. In general, one gene encodes for one protein (of course, there are exceptions). Since there are thousands of proteins, there are thousands of genes. We’re still figuring out what different genes/proteins accomplish. Transgenesis means taking a gene (or genes) from one species and sticking it into another. Unlike another process known as cisgenesis, transgenesis involves adding genes from a species that is sexually incompatible with the organism in question. Transgenesis is like taking a gene from a pomegranate and adding it to an apple. In contrast, cisgenesis is like taking a gene from a red apple and adding it to a green apple. 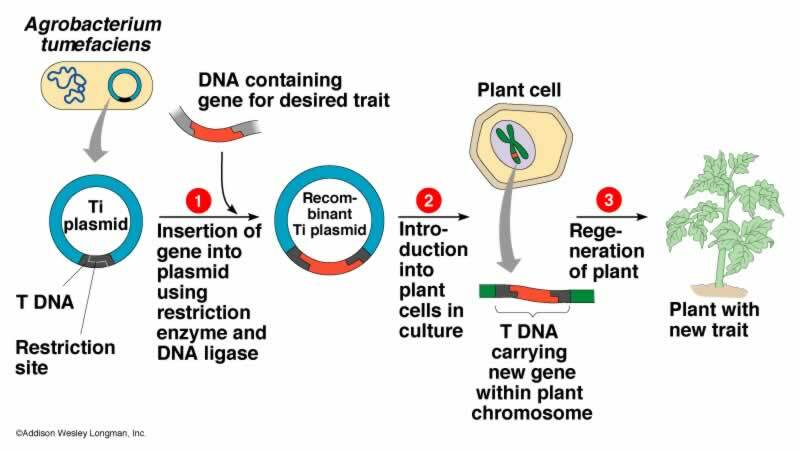 For transgenesis, the species doesn’t even have to be a plant: you can take a gene from an animal or bacteria and add it to a crop/plant or vice versa. Since biotech still isn’t at the point where scientists can “invent” a protein or a gene, they have to look in nature at the plants/animals/bacteria that have the desired trait, find out what protein accomplishes that task, and then use it in transgenesis. The reason why this is important in discussions about transgenesis is that the proteins that have been added to GMOs are already in nature. A wonderfully short abbreviation for the painfully long “5-enolpyruvylshikimate-3-phosphate (EPSP) synthase”. EPSP synthase is a protein that naturally exists in bacteria, plants, and fungi. The protein is part of a system that makes several crucial amino acids in these organisms. 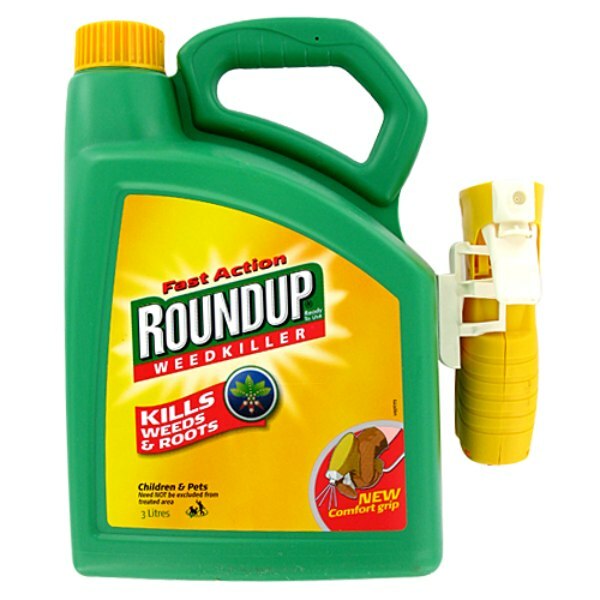 The active ingredient in weed killers such as Round-Up is “glyphosate”, a synthetic compound that blocks EPSP synthase. The plant can’t make the amino acids that it needs to survive so it dies. In order to make plants resistant to glyphosate, the EPSP synthase enzyme from a bacteria was added to the plants.This bacterial enzyme does the same thing (ie. it synthesizes the amino acids) but it’s just different enough that glyphosate doesn’t block it. It’s important to note that EPSP synthase doesn’t exist in mammals, which is why Glyphosate has low toxicity. Another mercifully short abbreviation for “aryloxyalkanoate dioxygenase enzyme” and is from the bacterial species Sphingobium herbicidovorans. The protein breaks down 2,4-dichlorophenoxyacetic acid (2,4-D), a pesticide that’s been used for many decades because it kills broadleaf weeds. 2,4-D mimics a natural plant hormone in these weeds, causing their leaves to grow uncontrollably, wither, and the plant eventually dies. The AAD-1 protein allows the plant to break down 2,4-D, so nothing happens to it (for a diagram of the biochemical reaction, please see here). In the US, there’s only one transgenic crop with the AAD-1 gene approved for cultivation: corn made by Dow Agro was just granted approval in 2014. However, there are several others in the works. There are several proteins from the bacteria Bacillus thuringiensis (Bt) that have been used in various crops and they’re known as Cry proteins. Apparently, there are over 200 different Cry proteins from the Bt bacteria and they’re toxic to specific orders of insects and nematodes. The insects that Cry proteins target are not all the same, which is why different proteins are used. Additionally, since the protein is toxic to insects, you may also see it referred to as “Bt-toxin”. This website from UCSD offers a really simple explanation on how the Bt-toxin works: the protein dissolves in the high pH environment in the insect’s gut. 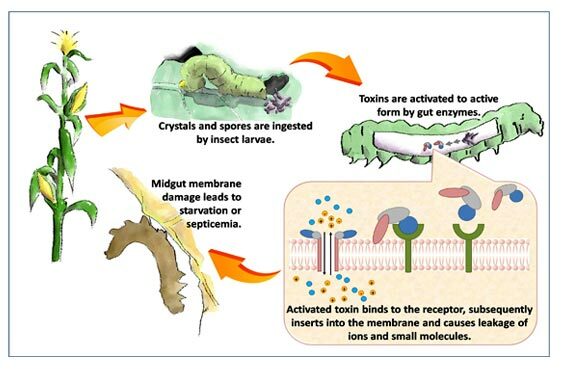 Then, it binds to receptors in the bug’s gut causing the wall in gut to dissolve, which eventually kills the insect. Cry proteins are also used in organic farming (if you weren’t aware that organic food production uses pesticides, please see bullet #2 here). The pesticide is considered to be benign to humans because the protein’s mechanism of action doesn’t work on mammals: our guts have a low pH and we don’t have the receptors that the Cry protein binds to. Bt-corn and Bt-cotton have been commercialized. There’s exciting work being done with Bt-eggplant in Bangladesh. In the United States, there are two commercial crops that have disease resistant traits: summer squash and papaya. 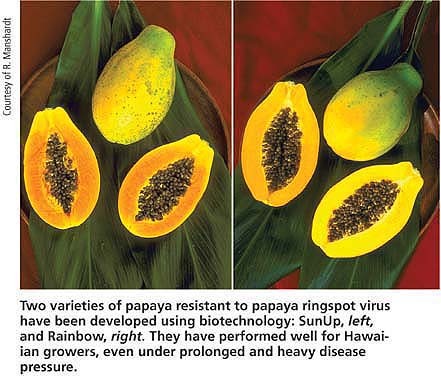 Hawaii’s Rainbow papaya is one of the great success stories of transgenesis: the papaya ringspot virus was threatening to wipe out this crop, which is a $17 million industry for Hawaiian farmers. In 1997, farmers started planting Rainbow papayas, which have a protein from the virus itself. Likewise, transgenic summer squash carries proteins from several viruses which can harm this crop. These proteins block the infection process from starting, in a process known as “coat-protein mediated resistance”. I think that what may frighten many about GMOs is the idea of adding something that “just doesn’t belong”. To a large extent, that’s true. When you cross breed two compatible species, it’s generally because there are specific qualities from species A and species B that you want to blend into a single species. For example, you may want to cross a rice strain that is naturally insect resistant with a second strain that grows very quickly. When you perform such a cross, you’re blending all the genes from the two rice strains and then trying to find the hybrid that has all the traits that you’re looking for. Now, imagine instead that you know EXACTLY what gene/protein(s) caused the insect resistance in the first rice strain. Instead of crossing the two strains and blending together thousands of proteins, you specifically add this one protein to the second strain. How would you feel about that? My guess is that the vast majority of individuals would be OK with it. Now how would you feel if that gene/protein came from barley and you’re adding it to rice? Again, I think many would be fine with it. I think that THIS is where the fear creeps in: the addition of a gene from a species that “doesn’t belong”. My background is in human genetics and I currently work at a company that analyzes human DNA. The majority of scientists I’ve spoken with don’t have this fear of transgenesis and I think that it’s because we see things as proteins, and genes, and units, and no gene “belongs” to a species. 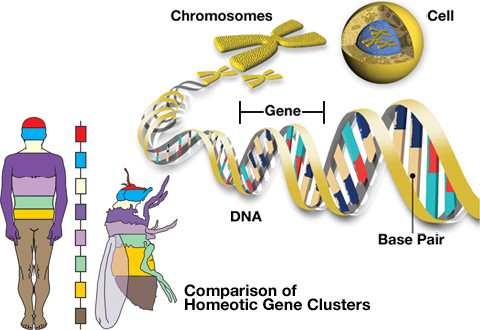 We see genes/proteins as building blocks that came into existence in viruses and bacteria, and have changed, morphed, been copied, and erased throughout evolution. So the concept of adding a gene that we know a lot about into another species doesn’t scare me nearly as much as it freaks out my husband. He seems to view a species as a whole, whereas I view a species as bits and pieces that make a whole. I’d argue that neither point of view is incorrect and that it’s all just a matter of perspective. Have a question on GMOs? Leave them in the comments section below and we’ll try our best to answer them! 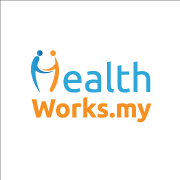 Hi Healthworks! Very interesting article. I’m curious about GMO impact and reach in Malaysia, and I’m keen to know specifics; as in exactly what types of Malaysian foods currently contain GMOs.